Chalk was blessed and given out at the end of Mass today. Everyone was invited to take some home to use to pray for, and bless their home. At the beginning of the year, following Catholic tradition, we pray for the homes of the parish and of all our people. 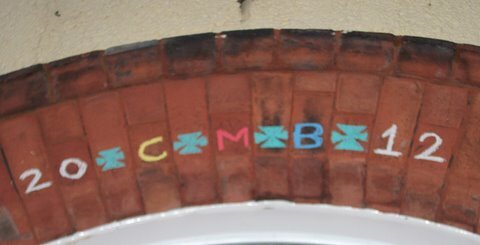 Using blessed chalk, (or if not blessed any chalk) either above the door, outside, or at the side of the door outside or inside, the markings 20 + C + M + B + 12 are made, or (20+K+M+B) 20 and 12 being the year, C (K), M, B being the intitials of the traditional names of the wise men, Caspar, Melchior and Balthasar, they can also stand for Christus Mansionem Benedicat, the Latin words meaning, May Christ bless this home. Loving God, may all who come to our home this year rejoice to find the love of Christ here; and may we seek and serve, in everyone we meet, that same Jesus who is your incarnate Word, now and forever. Amen. If you use this to do a blessing of your home we’d love you to send us a photograph of the 20 + C + M + B + 12 marked doorway. We had our priests come and bless our home for Epiphany. How do I send a picture? Perhaps being FSSP (traditional Latin Mass) priests, they write the year in Roman numerals, so the inscrptions over the doors appear as MM+C+M+B+XII. So someone chalked 20+c+m+b+08 on the threshold to my condo. What would the 08 represent? That would indicate a kind person blessed your condo in 2008. Maybe January 2016 will be the time to have the blessing renewed!